1 Grab an orange. Peal the rind off the outside of the orange. Separate the orange so you have only three orange slices in your hand. Keep the three slices attached to each other. Place the rest of the orange on the table. Next, ask an adult to help you tear off a piece of plastic wrap. Wrap your three slices together. Wrap the orange tightly, but carefully. Take a look at your creation. You have just created a model of an insect. Yep! You heard right, an insect! Keep reading and you'll discover why what you are holding represents the body of an insect. 2 Insects have three body parts. They have an exoskeleton, too. They also have other things like six legs, compound eyes, and antennae. These things are on the outside of their bodies. What you are holding in your hand represents the insect's body without the legs, eyes, antennae, and other features. 3 The three orange slices inside the plastic represent each of the three body parts of an insect. 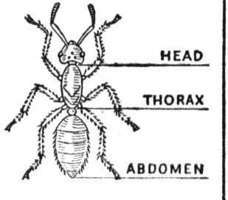 The body parts are the head, thorax, and abdomen. The head is where the eyes, antennae, and mouth are located. The insect's legs and wings are attached to the outside of the thorax. The muscles that control the insect's legs and wings are found in the thorax. The abdomen also holds the reproductive organs. It's also where organs like our heart, lungs, and stomach are found.